LA PORTE CITY — L. Marguerite Bauer, 95, of La Porte City, died Saturday, Sept. 25, at her caregiver’s home in Vinton. 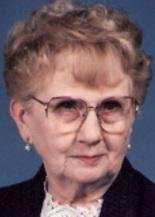 She was born Jan. 9, 1915, in Brandon, daughter of Louis and Elizabeth Arp Bachman. She married La Verne Bauer on Nov. 27, 1937, at the Little Brown Church, Nashua. He died June 23, 1978. Mrs. Bauer retired after working for many years in the Brandon school cafeteria. Survived by: two nieces, LeAnn (Don) Cone Keller of Dubuque and Christi Shields Fulwider of DeWitt. Preceded in death by: three brothers, Lewis, George and Arthur Bachman; and four sisters, Ruth Cone, Hazel Stevens, Helen Shields and Myrtle Caulkins. Memorials: may be directed to American Lutheran Church, 801 Monroe St., La Porte City 50651.